Apple Watch sales estimates have ranged from 8 million to 41 million. There were 34,146,428 Americans who made more than $70,492 in 2013. Are people in this bracket the intended market? If so, at the very least it seems there are at least 35 million fiscally-possible American buyers. World wide, there are many more. The other thought that occurs to me: people claim purchasing a $10,000 watch is inconceivably irresponsible and ostentatious. Well, if your salary is $70,000 and you purchase an Apple Watch Sport you are being as irresponsible in your purchase, whether it lasts for 2 years or 50, as someone in the American 0.1% who purchases the Edition. Some estimate that 31% of Americans would like to purchase an Apple Watch – that seems irresponsible for at least some of them. 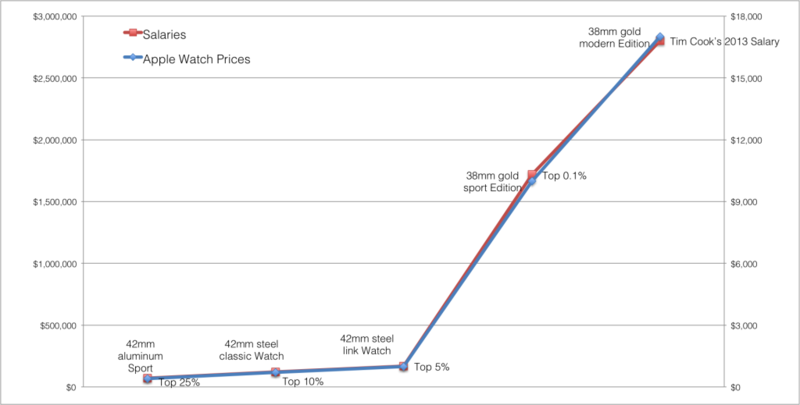 Is the Apple Watch a metaphor for American income inequality? Or maybe an Illuminati price fixing conspiracy? Probably neither. Finding patterns in numbers is fun but generally meaningless. Homework assignment: Match the 2011 income brackets to the Golden Ratio Phi.